Difference between revisions of "Cable Cars"
Legend has it that Andrew Hallidie, a man who designed and produced heavy steel cable for industry, used to enjoy late night walks through foggy San Francisco. On a rainy winter's night in 1869, Hallidie, on one of his walks, watched a wooden cart being pulled up the Powell Street hill by four very tired, overworked horses. One of the horse's iron shoes slipped on the wet cobblestones, the driver's brake chain snapped and the cart slipped swiftly backwards down the hill, dragging the horses with it. When the cart reached the foot of the hill the four horses and the driver lay in a heap of broken bones and flesh. Hallidie, apparently moved by the inhumane treatment of the workhorses, decided to combine his humanitarian instincts with his industrial know-how in order to design a car that could be pulled up and down the imposing San Francisco hills by steam-power driven cables. 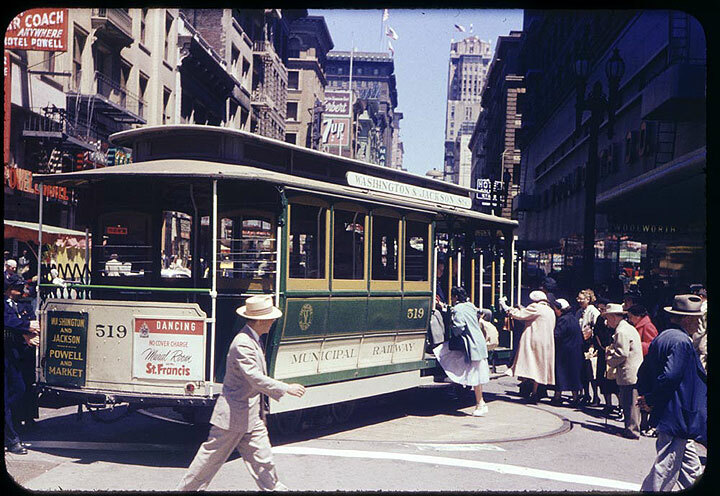 Cable car at Powell Street turnaround, June 16, 1954. 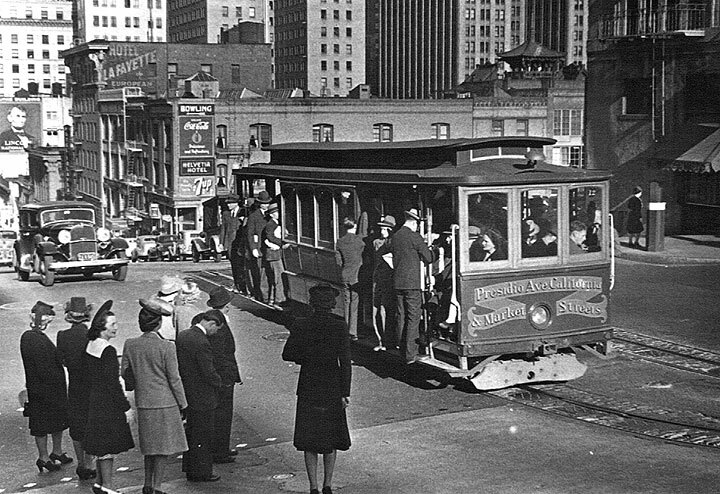 California Street cable car at approximately Grant Street, c. 1930s. Hallidie raised funds and was granted franchises by local government to build a cable line on Clay between Leavenworth and Kearny. At first his plan was met with much skepticism; one newspaper called the plan "Hallidie's Folly." It seemed unthinkable that any force other than God Almighty could drag a car up Clay Street. But Hallidie had already designed the high-tension cables and as soon as he and his engineers perfected a grip that was strong enough to hold the cables, tracks were laid on Clay. 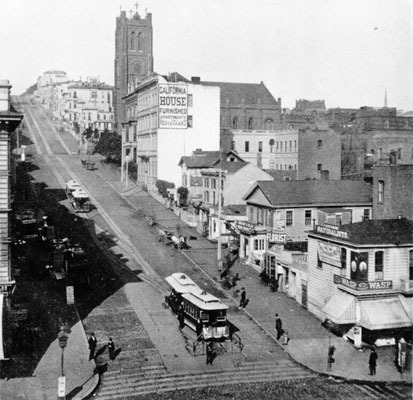 Early San Francisco Cable Car on Clay Street, 1878. On August 1, 1873 as dawn broke over the foggy city, Hallidie and his crew stood at the intersection of Clay and Leavenworth. The foot of Clay Street, some 500 feet below, lay shrouded in fog. The workman who had been chosen to make the first test run had lost his nerve at the last moment. Hallidie himself jumped on board, seized the grip and made a successful descent down to Kearny. As impressive as this short ride was, the true test was yet to come. Hallidie and the workers turned the car around on the turntable and, with Hallidie in command, the little car made its way back to the top of the hill as planned. Later that week the public was invited to ride the cable cars for free. On some runs as many as ninety passengers crammed aboard the car that was designed to carry 26. There were relatively few problems, however, and the new invention was deemed a success. Cable Cars had come to San Francisco. Governor Leland Stanford, one of the Big Four railroad magnates, was building a grand mansion at the south west corner of California and Powell. Seeing a chance to add years to the life of his prize horses, Stanford put up the capital to build the California Street Cable Car Line. It went into operation on April 10, 1878 and turned the sandlots west of Van Ness into a viable community of homes (called the Western Addition). Stanford more than quadrupled his initial investment. 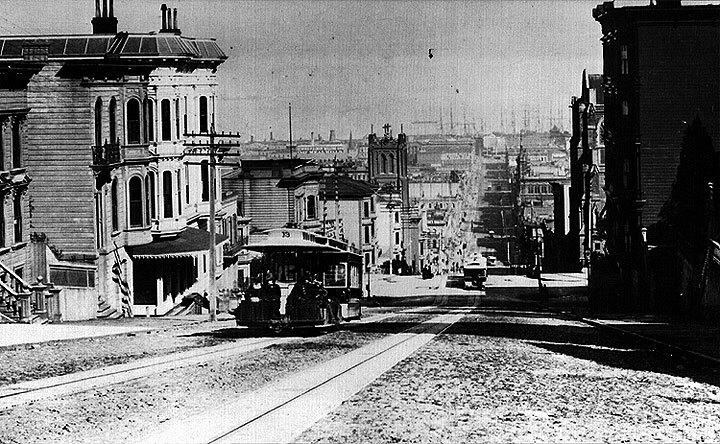 Cable car on California Street, 1879. 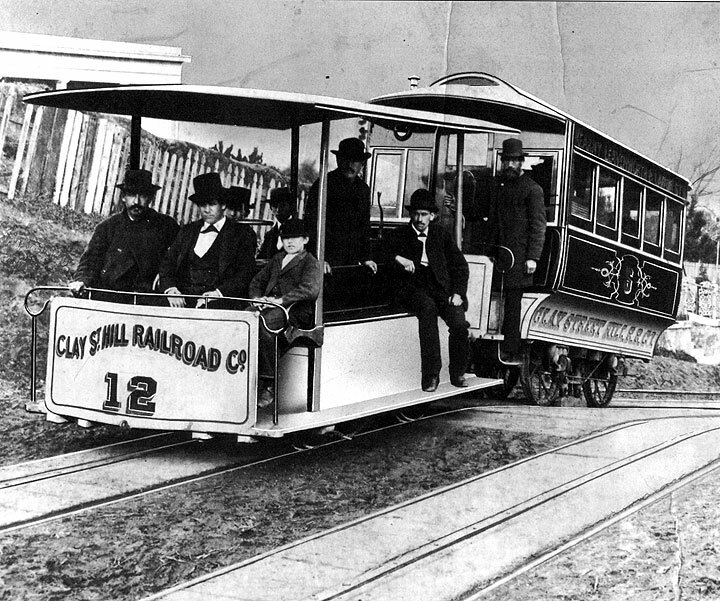 Within ten years of the initial Clay Street voyage, cable cars were running along Sutter, Geary, Market, Ellis, O'Farrell, Post, Powell, Sacramento, Washington, Jackson and Union Streets. The cable cars were more than just a practical transportation device, they quickly became the sentimental property of all San Franciscans. People would gather at the turntables to help the gripman turn the cars around, a ride on the cable car was compared to a ride on a roller coaster or a ferris wheel, and the image of the little cars cresting the impossible peaks became the poetic image of San Francisco. Tony Bennett's hit "I Left My Heart in San Francisco," with its famous line about the little cable cars climbing "halfway to the stars," sealed this symbol into the minds of the nation. This didn't stop the city government from planning their removal in 1947, but they were defeated by citizens' opposition. Again in the mid-1970's there was a move to replace the cable cars with far more efficient electric busses but public outcry led instead to a major overhaul of the existing system in the early 1980s. Today the cars run on only three routes and mostly for the benefit of tourists. Despite these setbacks, however, all but the most cynical city-dweller has a soft spot in their heart for these rolling pieces of history. Friedel Klussman, to whom any move to abolish San Francisco cable cars is a call to arms, receives a handsomely decorated testimonial letter from grateful employees of the California St Cable Railroad Co. Ernest Thompson and A. J. 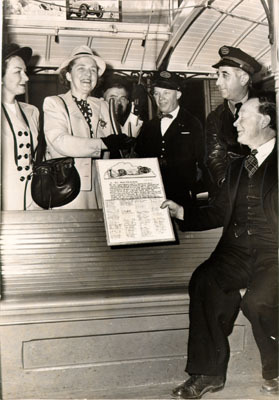 Wall (right) make the presentation in behalf of their fellow employees, two of whom are looking on, as is Mrs. Carl Eastman (1948). 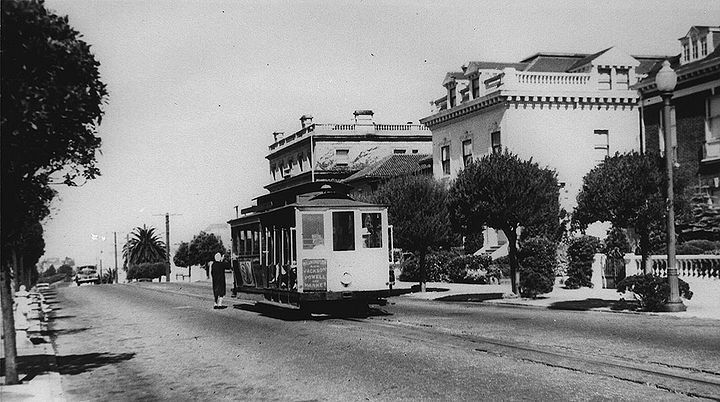 Cable car in Pacific Heights, c. 1930s. 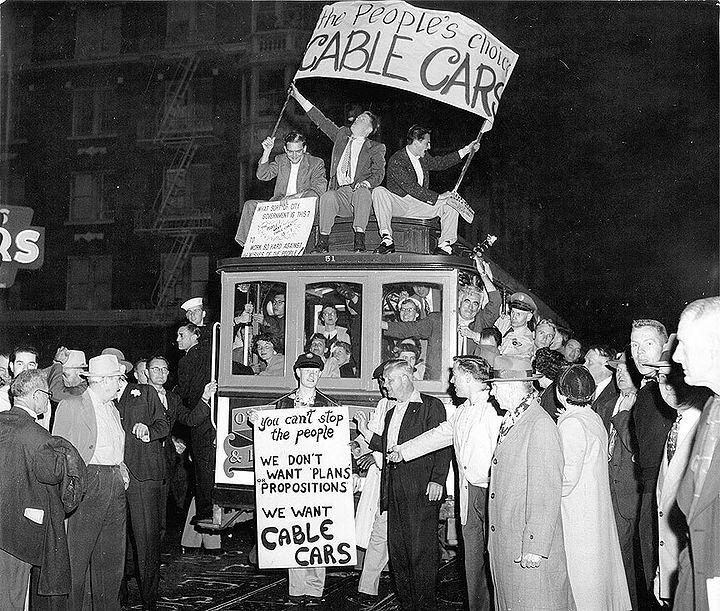 Demonstrators clamor to save the cable cars, 1947. In January, 1947, Mayor Roger Lapham announced that the cable cars running on Powell Street would soon be shut down as part of a city-wide modernization plan. Across the country, urban rail systems were being phased out in favor of the more modern bus systems touted by the large automobile manufacturers and their allies among the tire and oil industries. San Francisco's famous cable cars, already seven decades old, were targeted, along with the Key System which was running trains across the lower deck of the Bay Bridge into the Transbay Terminal at Mission and First Streets. But the cable cars were not so easily dismissed. A number of San Francisco's wealthier citizens retained a romantic attachment to the charming vehicles. Two months after Mayor Lapham's announcement, on March 4, 1947, Friedel Klussmann founded the Citizens' Committee to Save the Cable Cars. Klussman was a member of the SF Federation of the Arts as well as the California Spring Blossom and Wildflowers Association, and became the visible head of a local revolt. A popular movement to save the cable cars soon swung into action, forcing the Board of Supervisors to place the issue on the November ballot in 1947. The cable cars were saved when 77 percent voted in favor of a city charter amendment to preserve the cable cars. Silent footage of cable cars turning around at Powell and Market, c. 1920s. Though they sure beat buggies, cable cars are not 100% safe. Over the years, cable cars have been involved in a number of weird and awful accidents. On December 15th, 1899, for example, the great science-fiction visionary Robert Duncan Milne was squashed by a cable car in the middle of Market Street. Perhaps the weirdest accident story transpired in 1964, when a woman who had been involved in a minor cable car mishap sued the City. The only injury she suffered was a purely psychological one: She claimed that the accident had turned her into a nymphomaniac, for which she wanted half a million dollars in compensation. An expert witness, Dr. Louis K. Boswell, a specialist in electronically-induced hypnosis, played tapes of his 44 sessions with the nymphomanical victim. Dr. Boswell, who had been barred from the American Society of Clinical Hypnosis due to his unorthodox methods, had his office on the ninth floor of the Fox Plaza building—a building allegedly crawling with bad vibes since it was cursed by Satanist Anton LaVey. The jury heard the case, kept a straight face, and awarded the nymphomaniac $50,000. 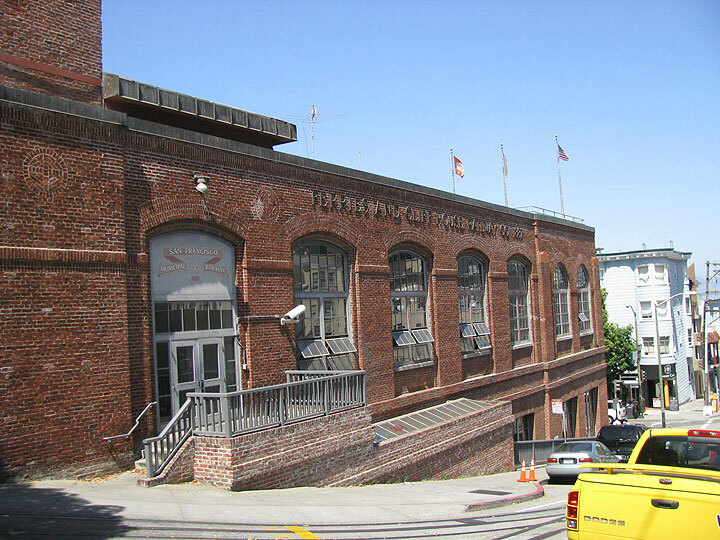 Cable Car Museum, 1201 Mason at Washington Street. 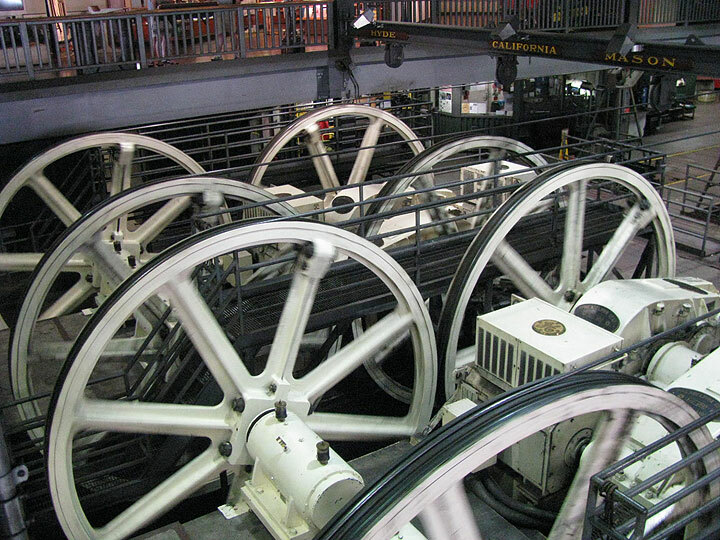 Cable Car Museum, cable wheels running inside.